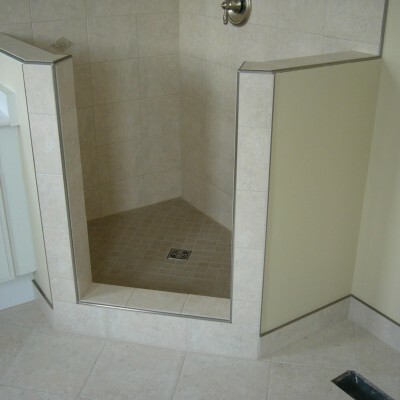 Schluter Systems has been manufacturing tile profiles and the Schluter Schiene metal profiles for over thirty five years. 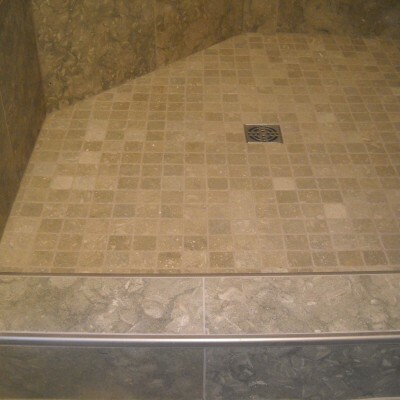 Since tiles are typically no longer laid in a mortar bed, but embedded into special adhesives, the outer edges of the tiles are therefore exposed and unprotected. 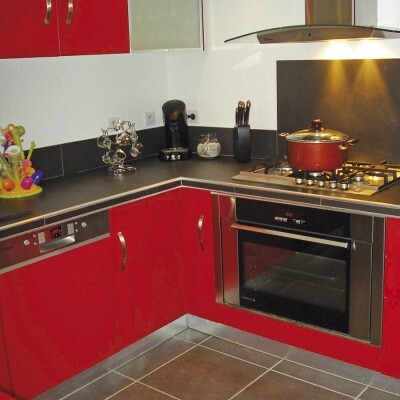 The Schluter Schiene profile proved quickly to be an excellent edge protection while being aesthetically pleasing at the same time with its large variety of finishes and sizes available. 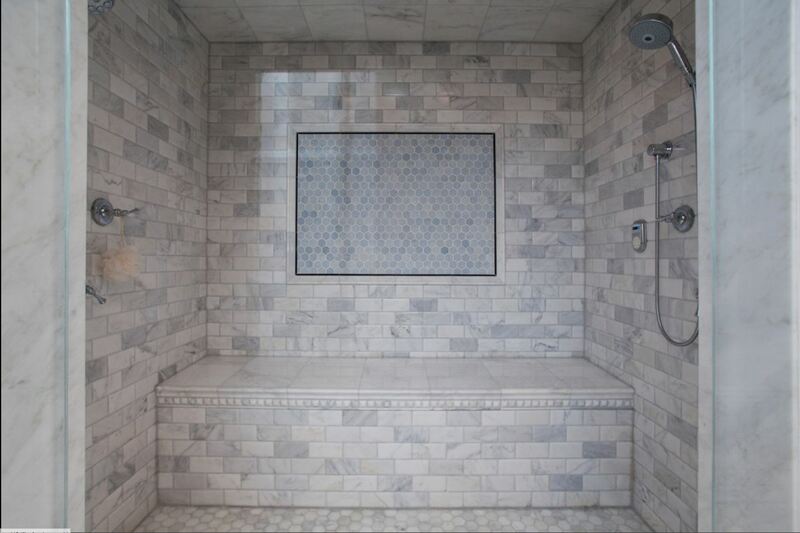 Schluter profiles and Schluter transition pieces are essential tools needed for today’s installation methods and for the specific materials that are continually being specified on jobs throughout the Los Angeles Tile area. Schluter Edging and Schluter Profiles are extremely necessary when it comes to porcelain or ceramic tiles that do not offer any tile trim such as a bullnose or quarter-round. 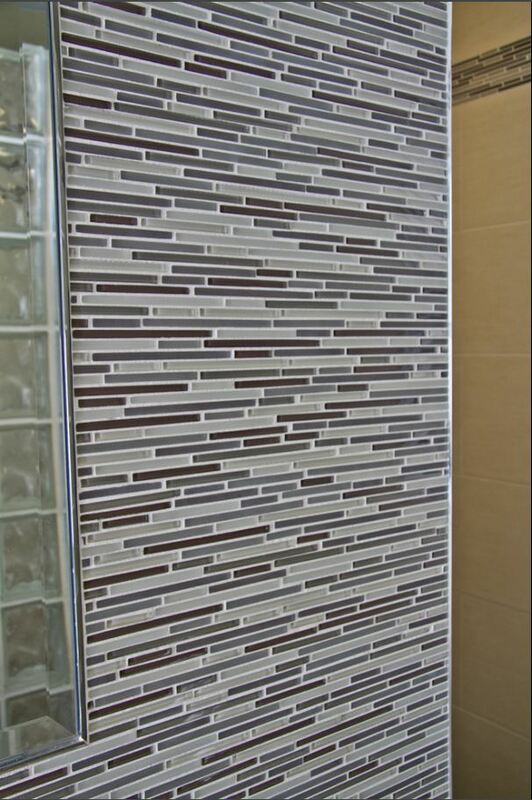 The Schluter Trim will act as the finishing piece of the tile along the shower walls, in order to give it a completed and finished look. 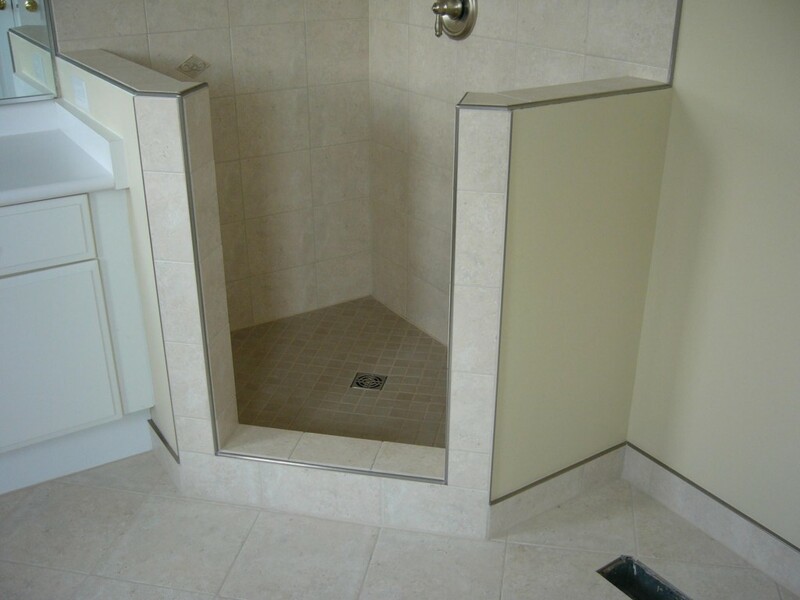 It is extremely important for a shower to have a finished edge along its length for it truly gives the end user the completed look that a shower needs. 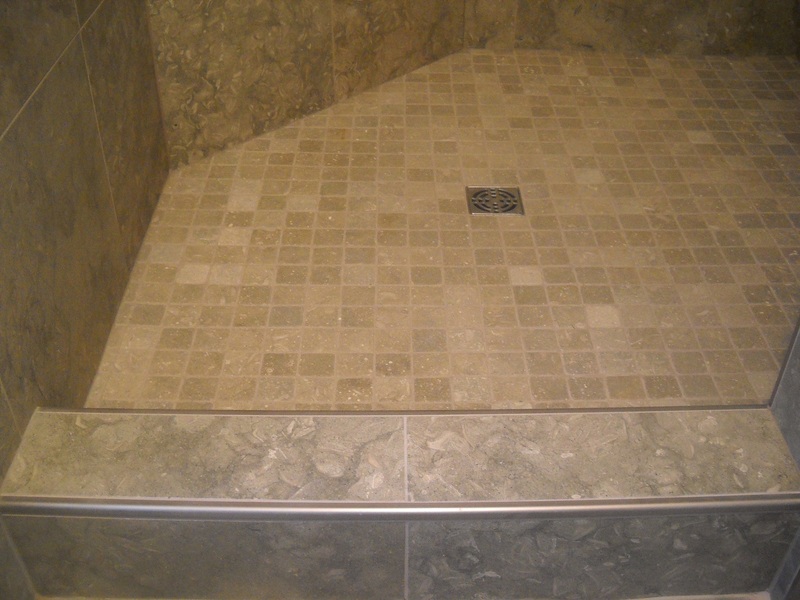 One of the wide benefits of Schluter Systems is their extensive catalog of Schluter Metal Edging and Stair Edging. 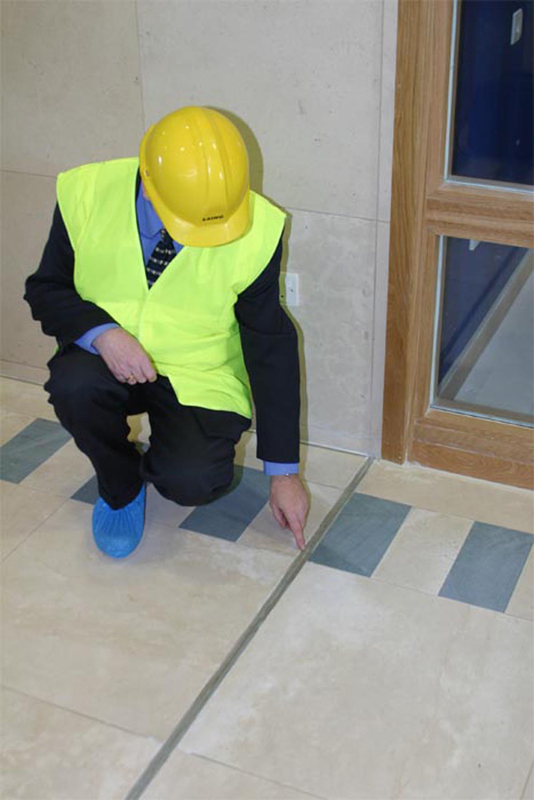 The ability to order the Schluter Edge in a variety of sizes makes it perfect for any application no matter the thickness of the tile being used. 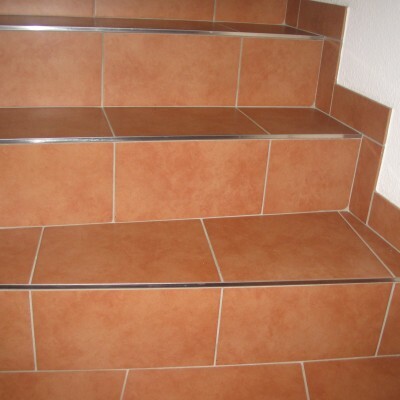 The Schluter Schiene is one of the more popular metal edgings that Schluter offers for its wide usage makes it a perfect fit for edge protection on wall surfaces, floors, and other tiled edges. A huge advantage of the Schluter Schiene is the availability of the Schluter Schiene Radius which allows the end user to use the metal edging around bends and curves. 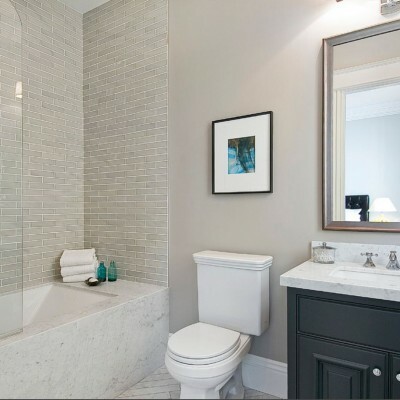 This is a huge advantage if a customer has a circular tub that needs metal edging or has a floor with an intricate mosaic that has curves and radiuses. 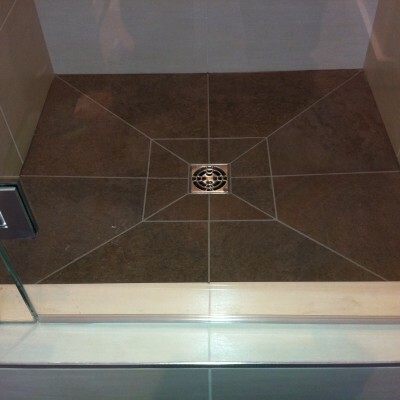 One of the most popular uses of the Schluter Schiene is for transitions between a tiled floor and a carpet floor. 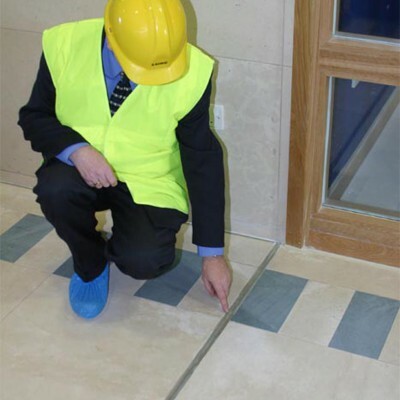 The ability to separate the two different floors allows for the end user to protect the edges of their tile and not have to worry about them getting damaged or causing a trip hazard due to the difference in height between the two. 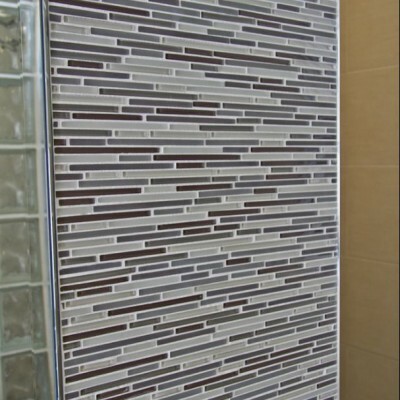 The Schluter Schiene comes in a variety of thicknesses that will work from a glass tile that is a 1/8” thick all the way to a ¾” stone paver. 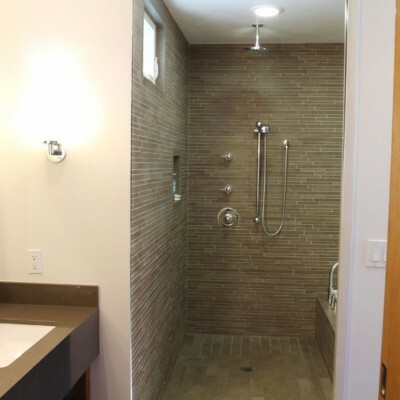 The Schluter Schiene is available in a variety of popular finishes such as Bright Chrome, Satin Anodized Aluminum, Bright Brass, Bright Nickel and Stainless Steel. 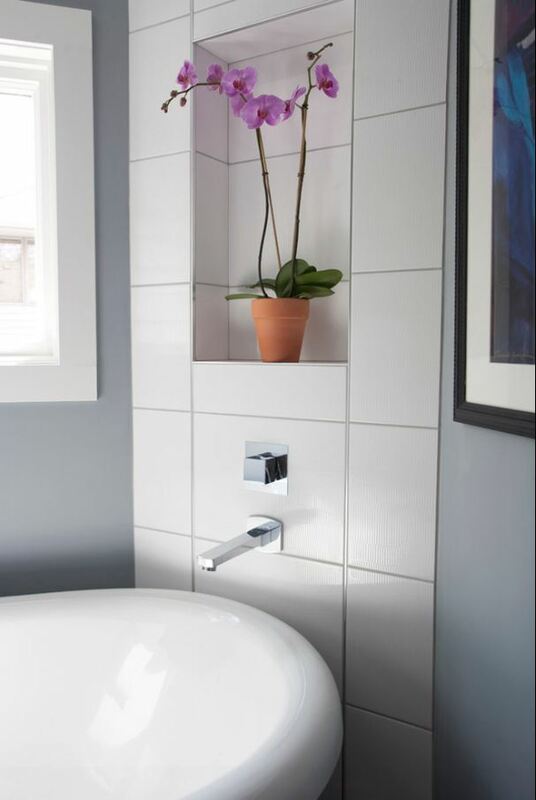 The large variety of finishes within the Schluter Metal collections allows our customers the ability to match any hardware they might have in their bathroom or kitchen, in the likes of fixtures and appliances. 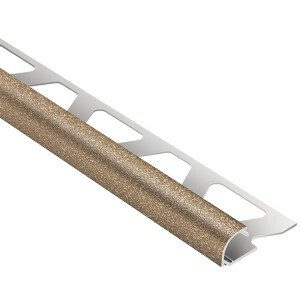 The second most popular metal edging from Schluter that we carry and sell the most of is the Schluter-Rondec. 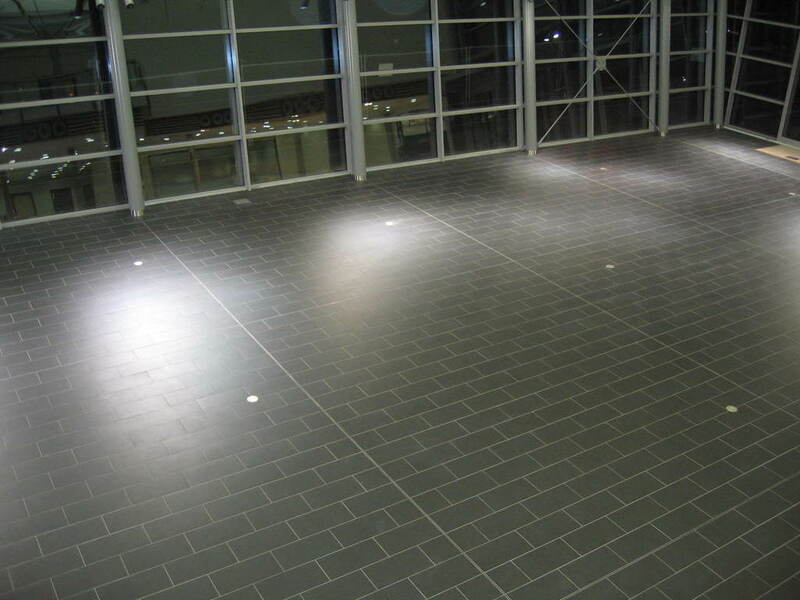 The Rondec Schluter is a finishing and edge protection piece meant for the outside corners of tiled surfaces. 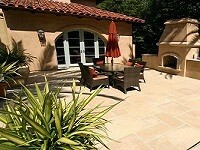 It is meant to be secured beneath the tile and reveal its symmetrically rounded corner along the surface edge. 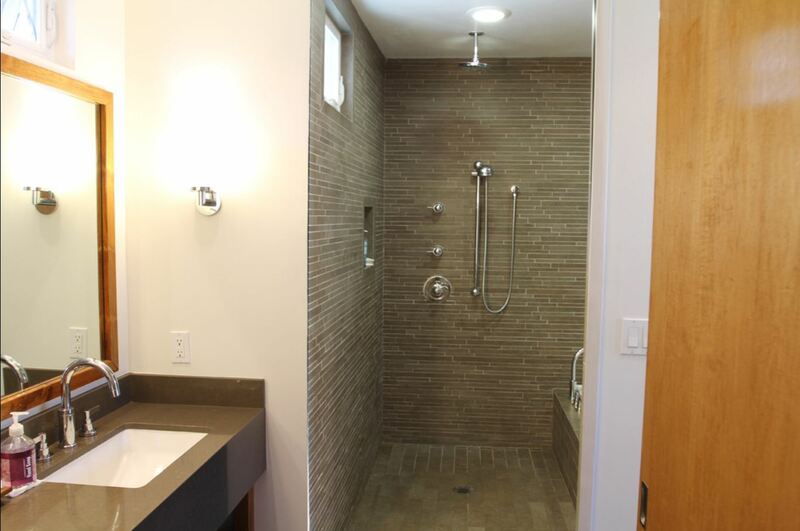 The wide range of finishes and sizes allows the Schluter Rondec to be coordinated with numerous grout colors, tile colors and decorative designs. 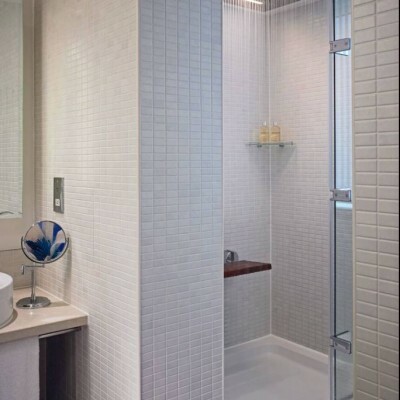 In addition to its decorative effect, the Rondec profile protects the edges of the tile against damage caused by mechanical stresses. The Schluter-Rondec in the stainless steel is particularly resistant to wear when used as an edge protection. 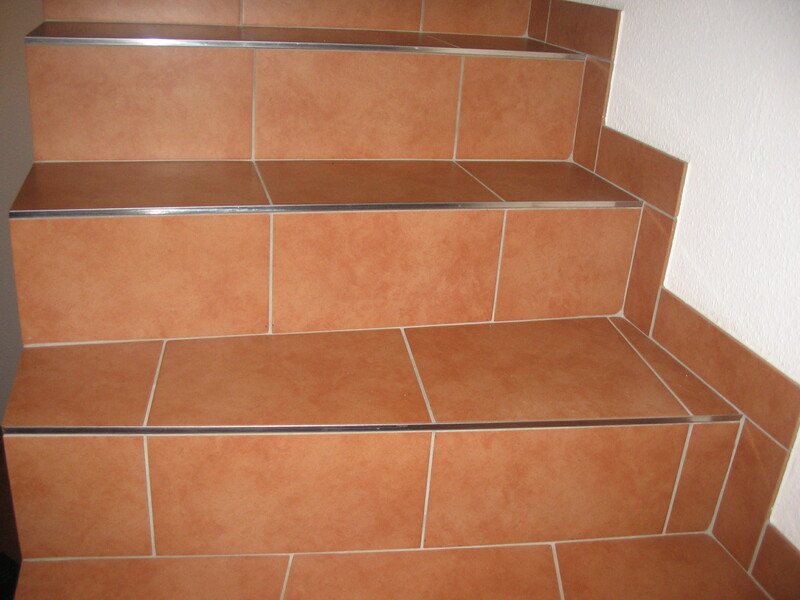 The Schluter Rondec-Step can also be used as a stair-nosing to provide grip and protection for the exposed tile edges. 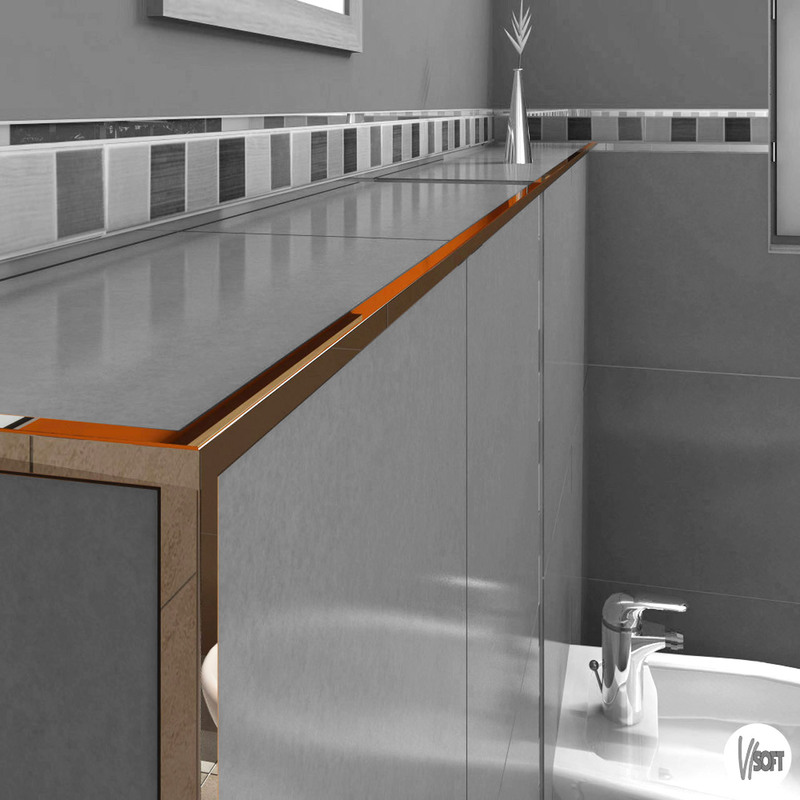 One of the great benefits of the Rondec is the Schluter Rondec Corners that include matching inside and outside corners, including sink corners and connectors that are available as well. 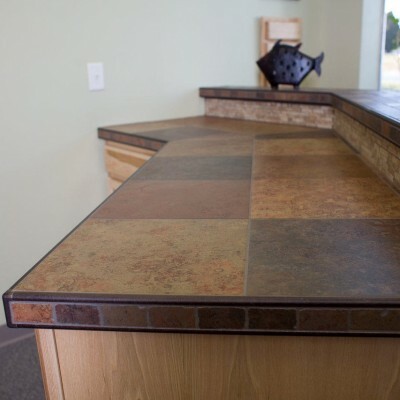 The availability of matching corners is the perfect way of completing a job and making sure that all of the corners have consistent matching finishes. 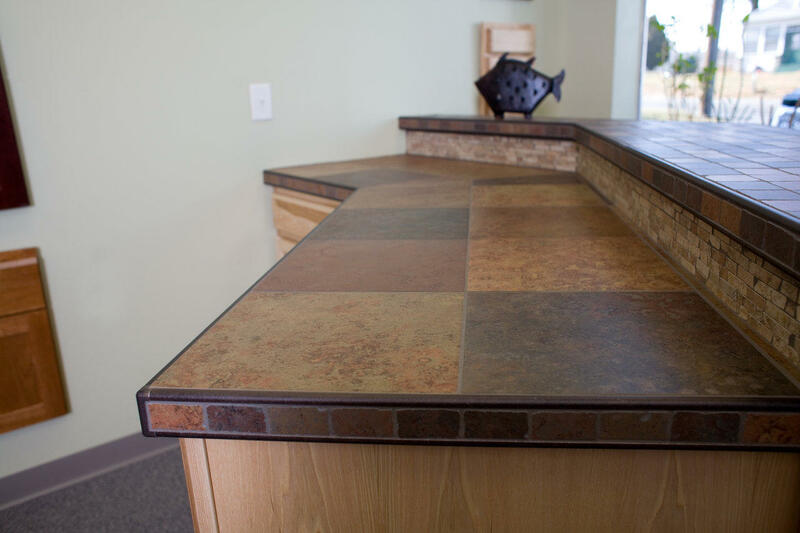 The Schluter-Rondec ct is another popular Schluter Rondec metal trim that contains a double-rail edging profile that is meant for countertops to be fitted with a ceramic or stone tile covering. 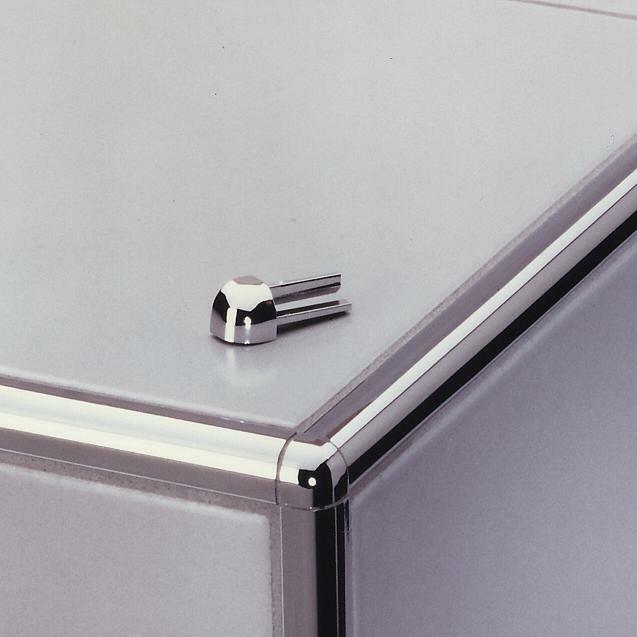 The top and bottom edges of the Rondec ct are symmetrically rounded and meant to match the standard Rondec profile. 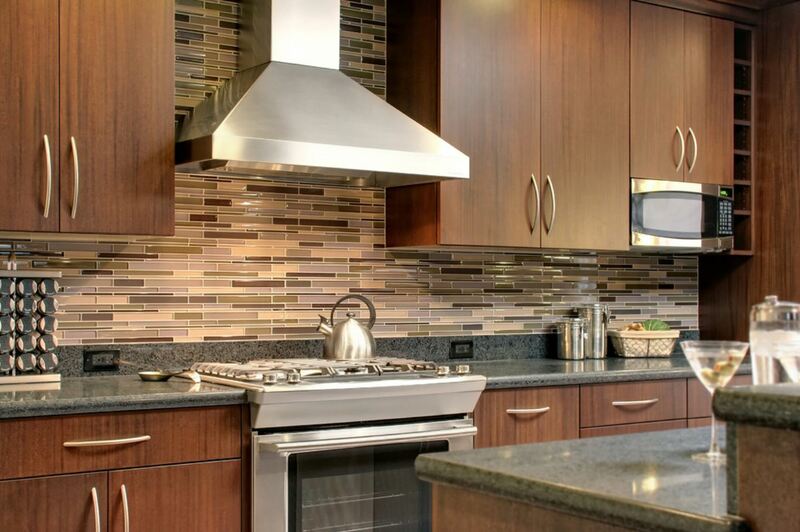 The profile is even available in the popular Tuscan color-coated aluminum various surface finishes in order to allow for additional decorative design and accent finishes within different home styles. 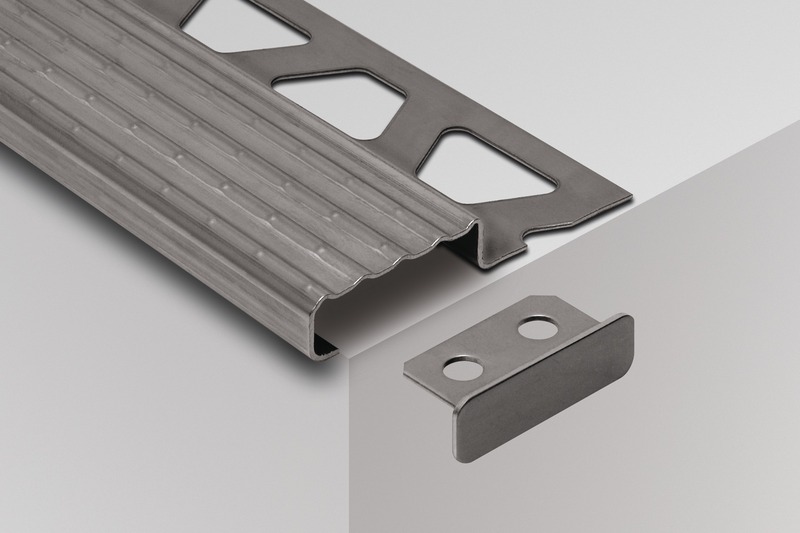 As you have seen, Schluter carries a wide range of metal trims that range from the traditional tile profiles and Schluter edge profiles all the way to movement and joints along with tile expansion joints. 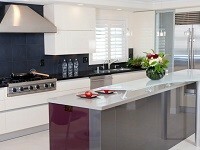 The Schluter Dilex collection offers a wide variety of movement joint metal trims along with Cove Shaped profiles. 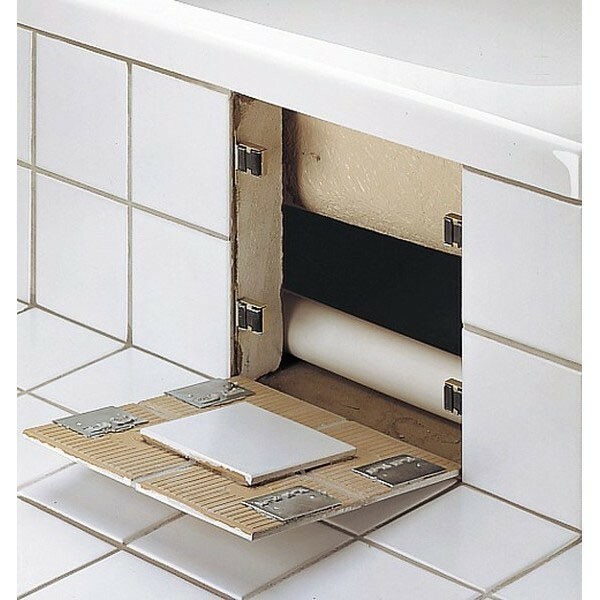 The Schluter Dilex-MP is a movement joint that is designed to provide a movement joint in tile installations that are set in a mortar bed. 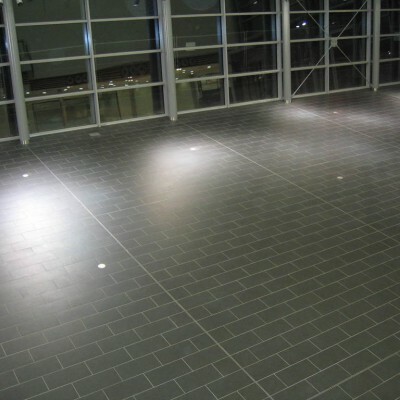 The Dilex profile is meant to be placed in between the tiles and features a flexible central zone that is meant to accommodate movement on a high traffic floor. 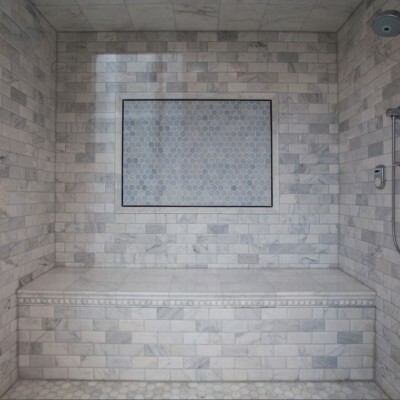 The Schluter Dilex-BWS is another surface joint that Schluter offers to provide a stress relief from movements in the tile field caused by thermal and moisture expansion/contraction and loading. 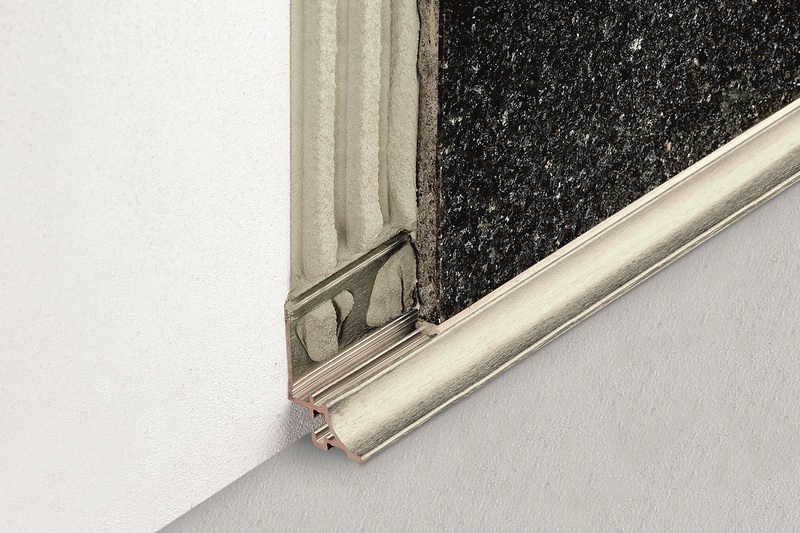 The Schluter Dilex-BWS is only 3/16” wide and is meant to match many common grout widths while providing a profile that will be suitable for both residential and medium-duty commercial applications such as an office building or retail store environment. 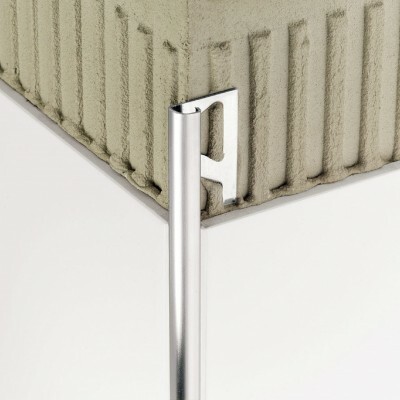 The Schluter Dilex-AS is a perimeter joint that is meant to provide a flexible connection between the tiled surface and the fixed building elements (bathtubs, countertops, shower-trays) while ultimately preventing sound bridges and reducing sound-transmission. The perimeter joint is meant to accommodate movements that are attributable to changes in loading, moisture, and temperature. 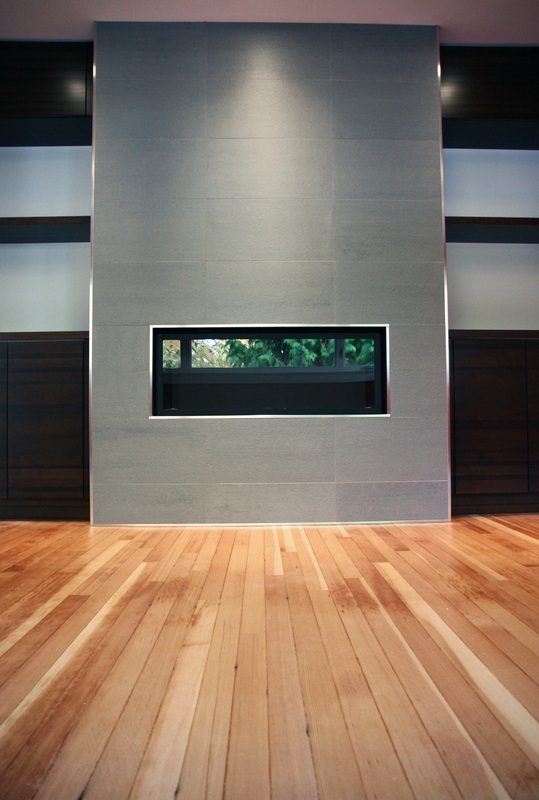 The Dilex-as is an ideal perimeter joint for transitions in sound-rated floors since it prevents sound bridges. 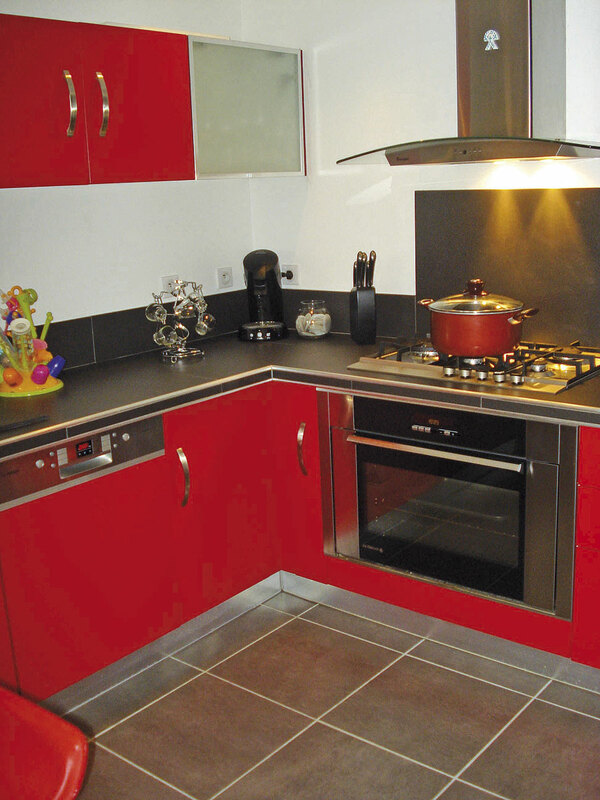 The Dilex-as is suitable for tiles that range from ¼” to ½” thick. 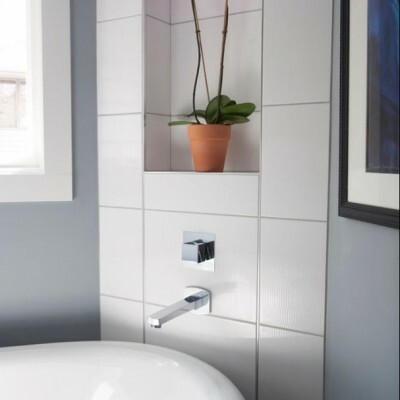 Along with their wide range of movement and joints, Schluter offers numerous Cove-shaped profiles that are meant to provide a neat, hygienic method, for treating transitions from a horizontal and vertical application with a clean curved surface. 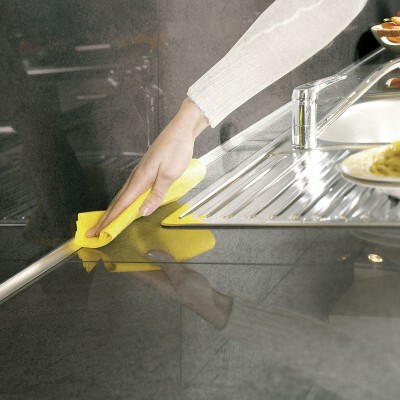 The Schluter Dilex-AHK is an attractive option for countertop and backsplash transitions for it prevents the accumulation of dirt and makes for easy and simple cleaning. 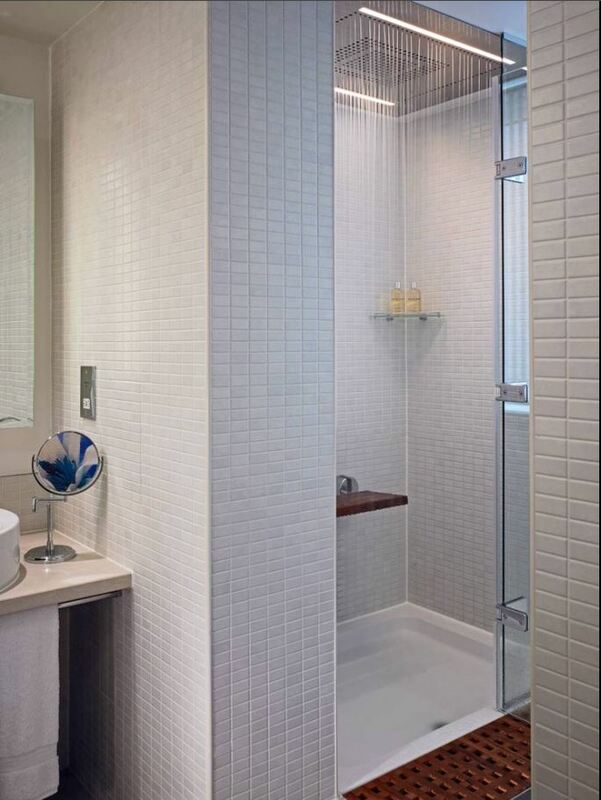 The profile separates the tile fields that meet at the inside corners where limited movement is expected. The Schluter-Dilex-AHK prevents water penetration and provides the strict hygienic requirements for commercial kitchens, bathrooms, food processing plants and any tiled environment where a sanitary cove base is desired or required. 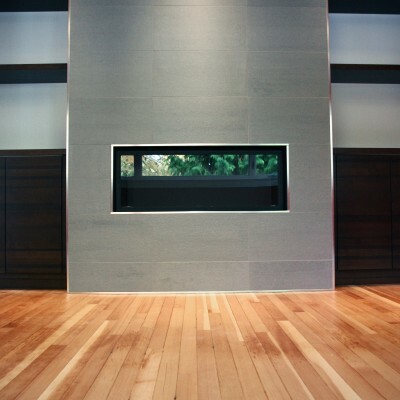 One of the huge advantages of using the Schluter Dilex-AHK cove-base is that the trim pieces are available in a wide range of finishes; Satin Anodized Aluminum, Polished Chrome, as well the Tuscan color-coated aluminum finishes. 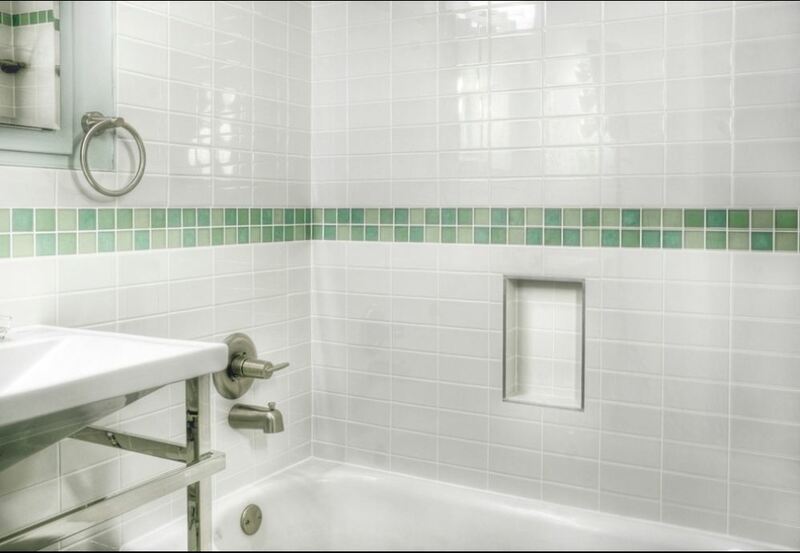 The Schluter Cove-shaped profiles such as the Dilex-AHK, Dilex-EHK, Dilex-EKE, Dilex-HK and Dilex-HKW are all hygienic anodized aluminum trims which are ideal for any commercial application needing a sanitary cove base. 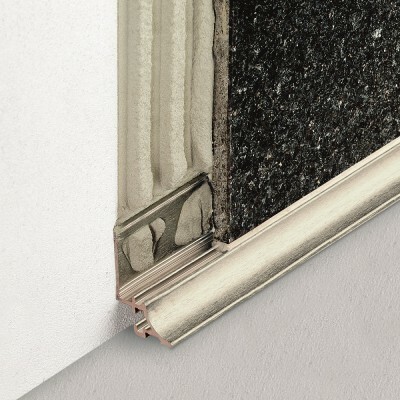 Since not all tiles come with the available cove-base trim, the Schluter Cove profiles offer the flexibility of using any material and putting them together with these metal trims. 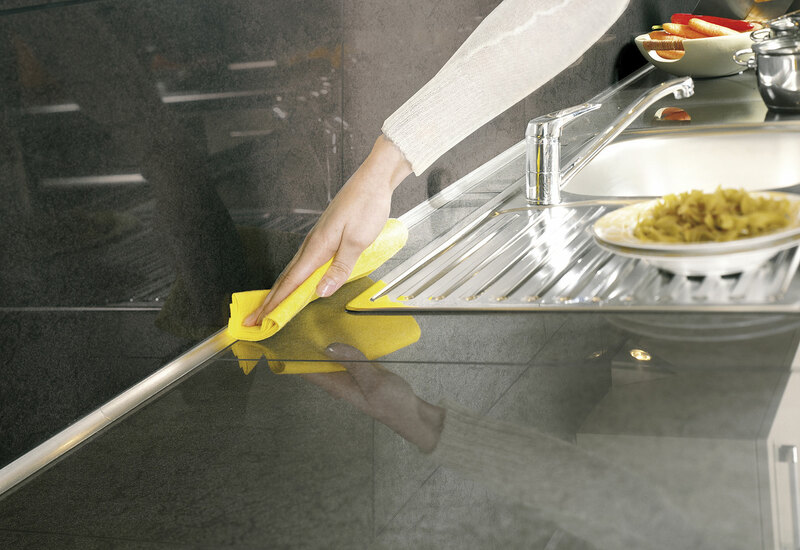 Due to the fact that these trims are hygienic and pass all city inspections, these are a must in a contemporary working kitchen or anywhere where the standard White Ceramic Cove Base just won’t do. 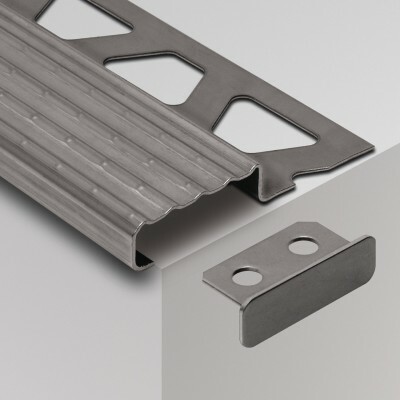 As you can see, Schluter Metal comes in a variety of Stainless Steel tile trim that can be used in a wide range of applications. 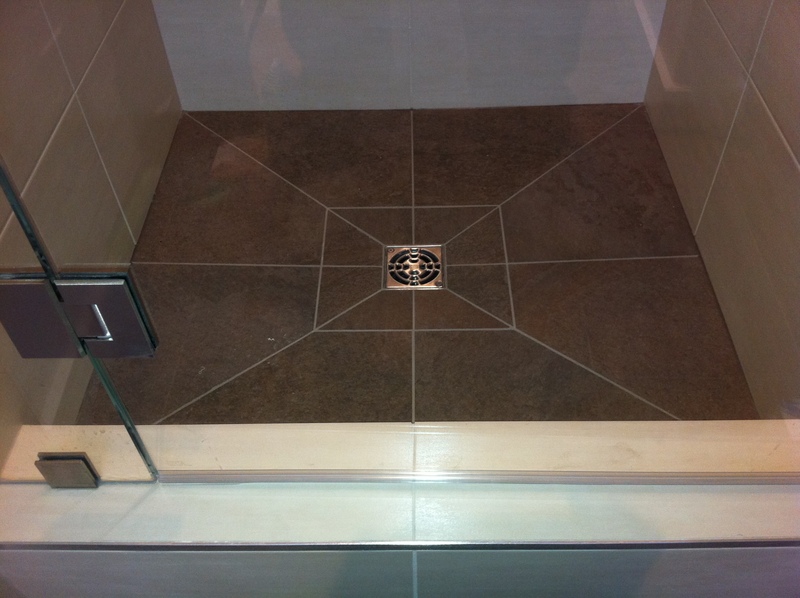 Schluter edging is a huge benefit in this industry with the influx of glass tile being used in homes today. 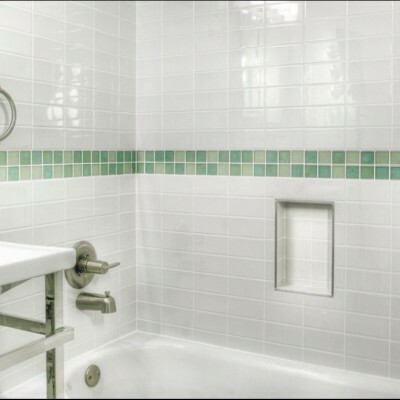 Since many glass tiles do not have any available edging or profiles, Schluter profiles are the ideal material to use in these cases. 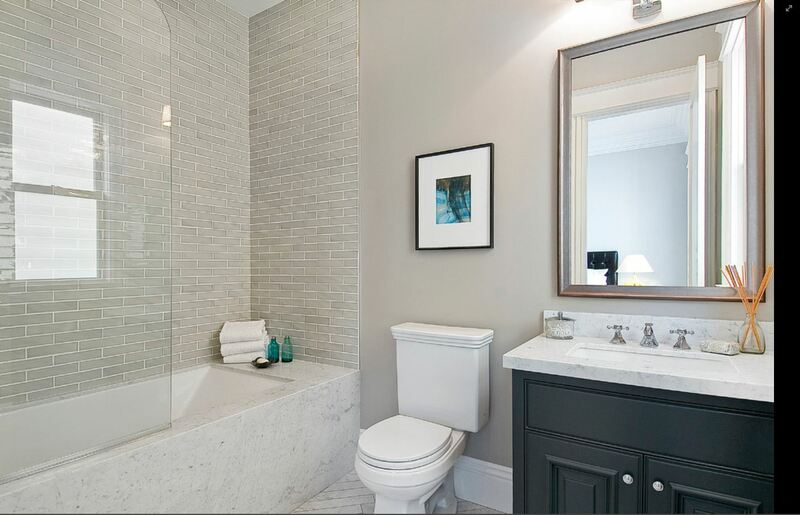 With more and more of today’s customers searching for a more contemporary and modern installation, Schluter metal trims are the perfect final pieces to use inside a shower or on top of a wainscoting. 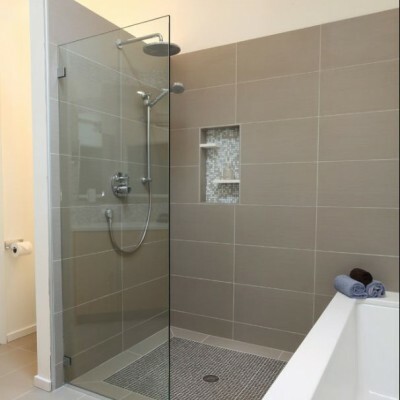 The wide range of available finishes, colors, and textures has allowed Schluter Systems to expand way beyond their Kerdi Shower-Kits and Water-Proofing Membranes. 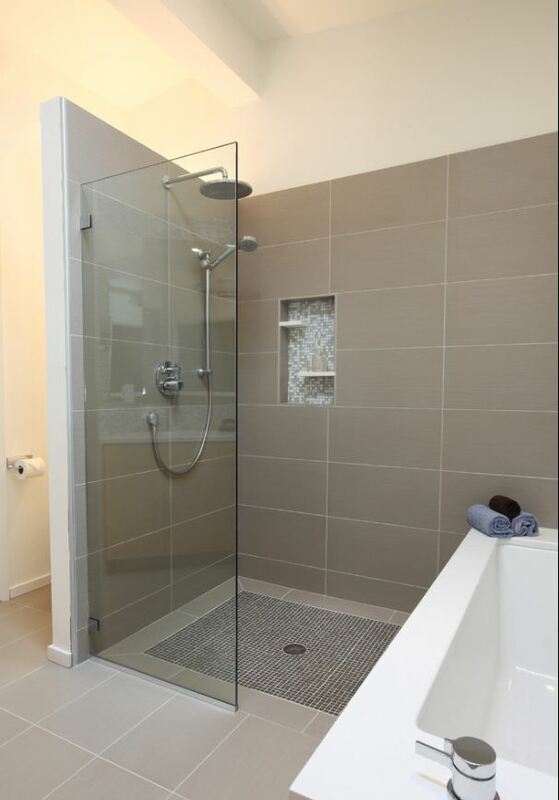 Please make sure to stop by either of our two Award Winning Showrooms to have us specify a Schluter Profile or Schluter movement joint for your next application. 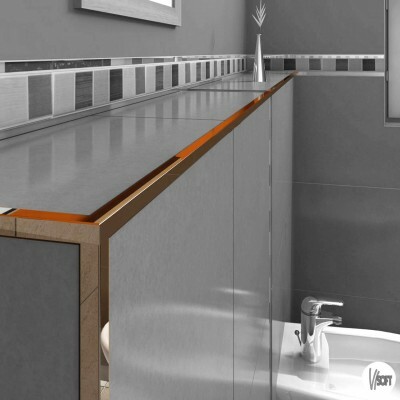 We stock many of the polished chrome metal edging in the various thicknesses, along with many specialty Schluter products such as the Schluter Rema and Schluter Reno. 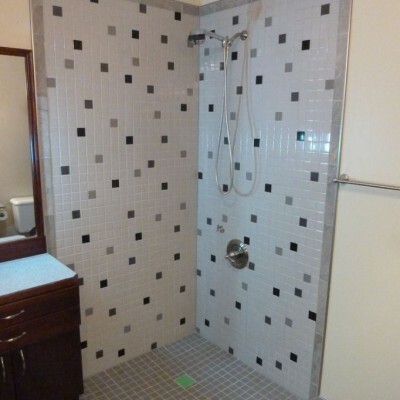 Certain special order products such as the Schluter Trep and the Schluter Trep e generally only take 2-3days to arrive from Schluter’s warehouse in Reno, NV. 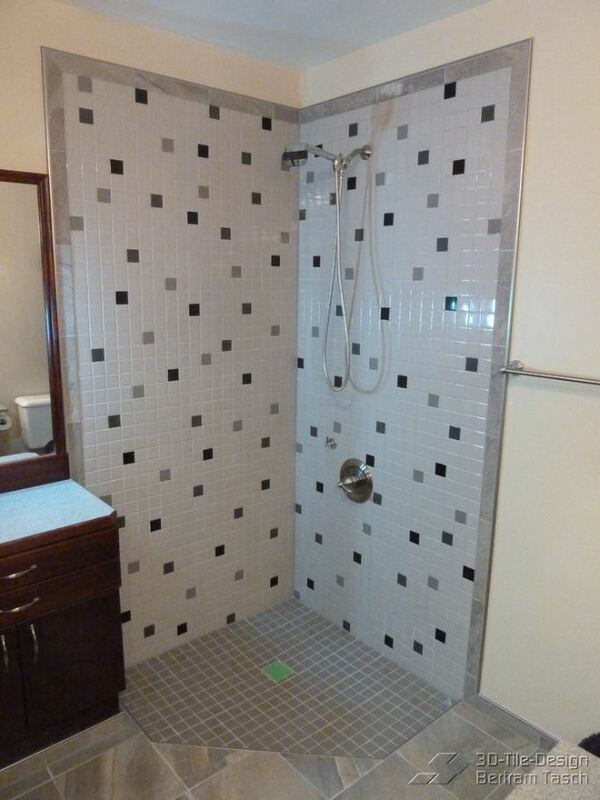 Please feel free to give us a call anytime with questions about Schluter products and their availability. 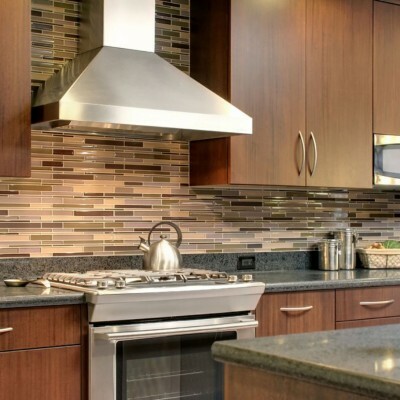 We are Southern California’s largest independent dealer of Schluter materials and are always happy to help answer any questions you may have regarding Schluter and their amazing products.